(Newser) – In the New York Times today, David Brooks uses his column to lay out the speech Mitt Romney should make to open tomorrow's presidential debate. Brooks' alterna-Romney promises that from now on, he's going to actually be himself. Then he runs down the many problems the next president will face: forging a budget compromise (alterna-Romney argues that he, as a Republican, could convince the GOP to raise taxes as Obama has failed to do); fixing Medicare and fighting rising health care costs; and combating sluggish growth. On the latter, alterna-Romney says, "I assume you know that everything President Obama and I have been saying on this subject has been total garbage." The Koch brothers will debate instead of me. I'm a crook, I stole money from just about every American tax payer. 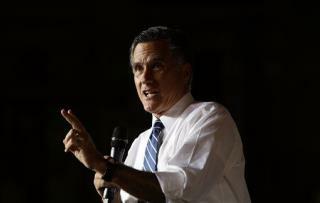 When Mitt was in charge of the 2002 Winter olympic's in Utah, they were four hundred million in debt. Then his buddy George W. Bush gave him one point three billion dollar government grant for the olympic's. [ tax payer's money ] Where is our change Mitt, like nine hundred million dollars. That is not counting the TV rights,endorsements,ticket sales,vendor's,etc,etc.